This 17” electric floor scrubber by Advance is a high-performance machine that has been designed to be cost efficient and easy to set up. 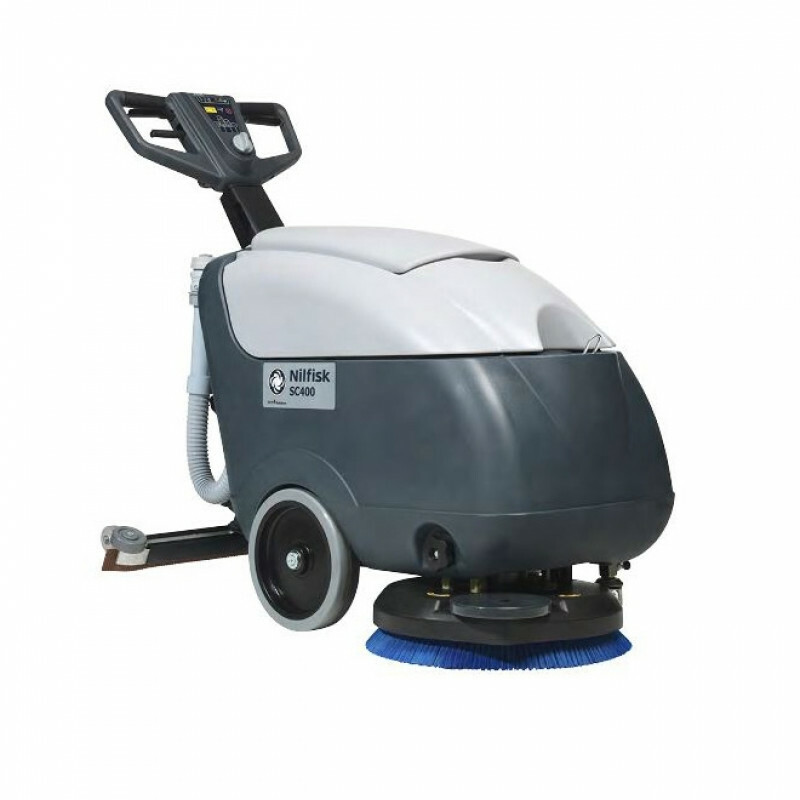 This machine is classified as a compact scrubber thanks to having a smaller build and being easier to operate and maneuver than more expensive larger floor scrubbers. The SC400 comes with a lengthy 65 foot cord to allow you to scrub up to 14,960 square feet per hour. A 6 gallon solution tank also provides you with enough solution to clean smaller rooms and buildings like classrooms, restaurants, offices, healthcare facilities, and more. The center-pivot squeegee system has been made to be tool less and incorporates a gas spring to insure the correct amount of pressure is put on the blades at all time to maximize suction during forward and reverse operation. The special Smart Solutions™ system gives the operator full control over the solution output and can allow the machine to be run for over an hour on a single tank of solution. This feature allows the SC400 to meet green cleaning requirements thanks to minimizing use of water and detergent. Thanks to these aspects, just one pass will produce a clean floor that is dry and ready to be used. To make this scrubber simple to operate, the machine can be turned on with a quick touch of a button. Designers have also built in a transport wheel in the front of the unit while also adding a holder for the included brush. They have designed the handle to be adjustable and ergonomic to enhance comfort, maneuverability, and ease of use. For quick activation, the squeegee can be activated with the user’s foot and is designed to break-away if hit hard to protect your machine and work area. If this Advance model isn’t to your liking, they also offer larger battery powered scrubbers like the 20 inch SC500™ and the SC450™. Both are made with the same dependability that Advance is known for. Other brands and sizes of auto scrubbers can also be found in our walk behind floor scrubber department.